Dragon fruit are increasing in popularity right now. I was recently grocery shopping and found one in the grocery store. I had never seen such a thing, nor heard of it before. I HAD to buy it and try it out for myself. I did some research and produced two videos with my lovely specimen, one sharing basic information about dragon fruit, and the other showing how to cut it. Below are links to those videos. Following the video links is my complete review of the dragon fruit itself. This may be helpful to you if you’re interested in trying one for yourself. I hope this helps! It’s the fruit of a climbing cactus plant, and is related to a prickly pear. It is grown all over the world. The two most common types have bright red (or hot pink) skin with green scales. The most common has white flesh inside with many black seeds (resembling kiwi seeds). The lesser common type has red flesh, also with many black seeds. The one I bought had white flesh. I had no idea which type I was buying because the sign for it had no such information. Mine came from Vietnam. It is noteworthy to know that the rind or skin of the dragon fruit is NOT edible, so be sure that is not included in whatever you’re doing with your dragon fruit. Needless to say, its appearance caught my attention and lured me into purchasing it, even though I had no idea what on earth it was! It’s appearance makes it very intriguing. It’s described as having a red rind, but actually it’s more like a strong hot pink color. It has green extensions on it that look “thorn-ish” but they are not sharp. 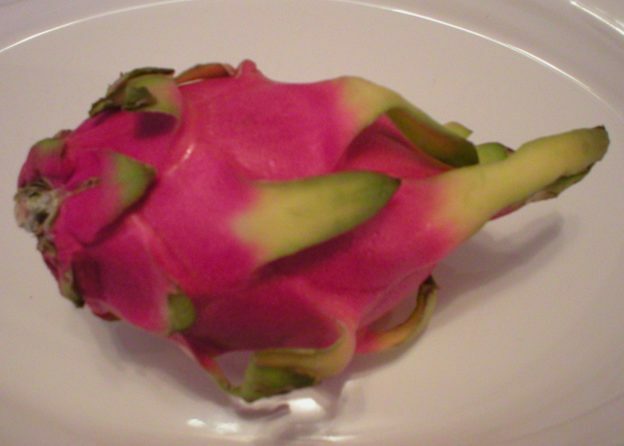 When cut, the dragon fruit either has white or red pulp inside with many black seeds. It resembles a kiwi (but the flesh is not green, but either white or red) with the tiny seeds in it. When I purchased mine, I had no idea what I was getting. From what I’ve researched, it’s ripe when it has a slight “give” to it when squeezed (similar to an avocado). A hard one is unripe and should be left on the kitchen counter for a few days to allow it to ripen. When I learned this, I tested mine and it did not feel hard, so I assumed it was ripe. Perhaps not. Again, since I was a dragon fruit novice, it seemed OK to cut since it did not feel hard (Maybe this was my imagination?). This fruit is mighty expensive for what you get. It does not keep well (no more than a day after being cut), so it’s basically a one-time cut and eat fruit. It can easily be shared between two or three people, or can be added to smoothies or a salsa to make it go further. However, it’s expensive. Mine cost $5.00 (well…$4.98 to be exact). For what you get for your money, you have to LOVE it to make that worth the cost, unless you have plenty of money to toss around! The texture is very much like that of a kiwi. The flesh is soft and very easy to cut with a knife or even scoop out with a spoon. The softness led me to believe mine was ripe enough to eat, even though I had never cut into one before. Maybe not. I was shocked when I took a bite of the dragon fruit. It was juicy and soft, but had absolutely NO flavor whatsoever! None, zip, nada, no flavor at all! When I purchased it, the cashier was very familiar with dragon fruit and commented (very sincerely) that the fruit was delicious and that she often included it in a smoothie with mango. I had no reason to believe she was lying to me. She did comment that she purchased hers from the local Asian market. After doing my research, I’m inclined to believe the cashier was used to eating dragon fruit with the reddish flesh rather than the white flesh. From my research, I learned that the red flesh fruit is sweeter than the white flesh. So, perhaps those who manage Asian markets know more of what they’re getting than American grocery store produce managers. Maybe. When I went shopping the next week, I found that same cashier. I asked her if she ate dragon fruit with the white or red pulp. She said she had only eaten those with red pulp. This confirms what I read…that the red pulp was sweeter than the white pulp. She was shocked when I told her that it had no flavor at all. She also said she always purchased hers at the local Asian market and they were always red inside. It seems like “those in the know” make a point of buying the red pulp variety. In my research, I learned that in some rare cases, people can have an allergic reaction to dragon fruit. It’s advisable to try only a few bites of it at first, if you’ve never had it before. I MIGHT be one of those reactive people. Because of this warning, I tried only a few bites and it didn’t take long before my mouth felt warm and a bit numb. I don’t think I ate any of the rind (which is not edible). I even felt the “warmness” down into my esophagus not long after swallowing the fruit. I don’t normally react in such a way to foods. In fact, I can’t think of ever reacting that way to anything in the past. I originally intended to share it with my husband in a fruit salad. However, he’s more reactive to food than I am. After experiencing my possible reaction to it, I decided not to share it with my husband for fear he would have a worse reaction. I’m sorry to say that it all went into the trash because of that. $5.00 literally thrown away. Maybe, just maybe I wouldn’t react to one with red pulp. I really don’t know! Do I recommend that you try one? Actually despite my experience, yes, I do recommend that you try one. However, I suggest you purchase one at a local Asian market, if you have one near you. AND/OR I also suggest you ask if has red or white flesh inside. It seems like the red flesh variety is the way to go here. I believe it’s worth trying just about anything at least once. After all, how would you know if you like it or not if you don’t run it by your taste buds? (Just don’t ask me to try anything with bugs…they’re not on my menu!) So, splurge and give dragon fruit a try. Know what you’re looking for and how to pick one out. That should give you an advantage over my personal experience, and maybe you’ll find a new delicacy to add to your food list! This entry was posted in Food and tagged about dragon fruit, dragon fruit review, dragon fruit taste, dragon fruit with no flavor, how to pick out a dragon fruit, review of dragon fruit on April 12, 2019 by Judi.